On the surface, capable teenage boys may look lazy. 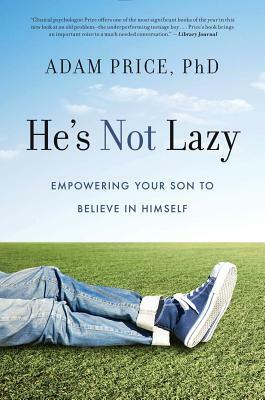 But dig a little deeper, writes child psychologist Adam Price in He's Not Lazy, and you'll often find conflicted boys who want to do well in middle and high school but are afraid to fail, and so do not try. This book can help you become an ally with your son, as he discovers greater self-confidence and accepts responsibility for his future. Adam Price, PhD, a clinical psychologist and author, has worked with children, adolescents, and their families for more than 25 years. He is an expert in learning disabilities and Attention Deficit Hyperactive Disorder (ADHD). Dr. Price lectures nationally to parents and educators, and has trained numerous clinicians in family and child therapy. He has written for both academic and popular publications, including the Wall Street Journal and Family Circle Magazine. Dr. Price maintains a private practice in New York City and Chatham, NJ. To learn more about Dr. Price, visit dradamprice.com.